You should have seen them at the opening. The people, that is – moving slowly through the large warehouse and thronging around two bars, a taco stand, a ping-pong table and a dance floor in the yard behind the building. The paintings, too, looked terrific. Twelve huge canvases, each approximately three-and-a-half metres high, faced each other on opposite walls of the space. They seemed to smile down on the bustle of sociability that unfolded between them. This scene-setting is not irrelevant, in the case of Owens’ gregarious and generous work. These paintings are calibrated for noise and fun. Despite her strong association with Los Angeles, where she is well respected for her support of other artists, Owens is not represented by a gallery in her home town. Consequently, she hasn’t had a major solo show here since her early and acclaimed presentation at the Museum of Contemporary Art in 2003. Her work may tolerate a wide range of presentational formats (the title of Paul Schimmel’s essay for her MOCA catalogue was ‘Plays Well with Others’) but she is still exacting about its contextualization. 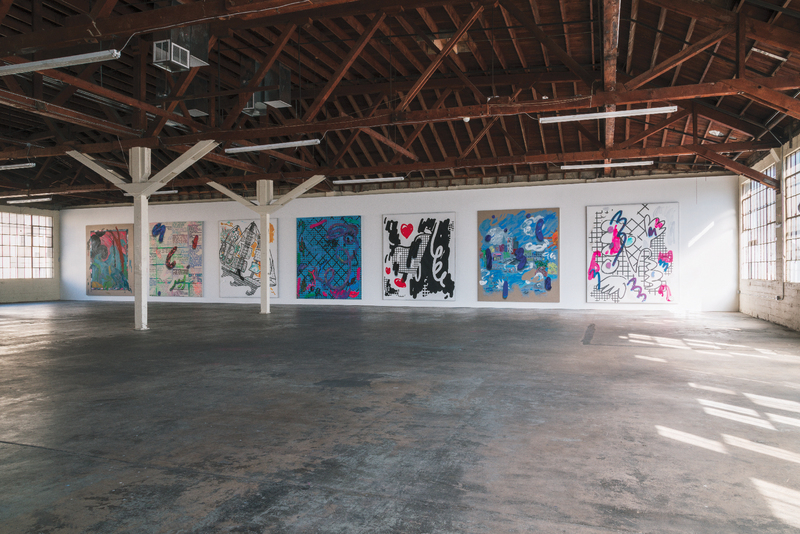 With support from Owens’ New York gallery, Gavin Brown’s enterprise, the space was leased specifically for the exhibition: a large, open warehouse with windows along two facing walls, situated in an industrial area on the east side of the LA River. As a gallery, it is known only by its address: 356 South Mission Road. The show has no title, no press release, no list of works. There is no reception desk; instead, Owens has invited local art bookstore Ooga Booga to set up shop at the entrance to the building, where they offer publications and multiples for sale, many by Owens’ peers. Also present at the time of my visit were her crew of studio assistants, busy with Owens’ additional endeavours – particularly her book-making projects – in other parts of the building. They had already been there for nearly a year, producing the works that now hang on its walls. Drips of paint still spatter the floor. The exhibition is scheduled to remain open for six months. During that time, an events programme will unfold: film screenings, dice games, karaoke and more. Not all of it will be public, but Owens hopes that there will be something happening nearly every week. What about the paintings? Are they actually any good? Is the artist’s attention to the milieu around them merely a distraction, or a qualifier for the work itself? Yes, and no. Yes they are good – spectacularly so, on a technical level at least. While Owens has fought the corner of diversity and formal freedom in painting, her work has not been as diverse as one might think. Instead, she has been steadily honing a set of aesthetic tools that she now wields with considerable virtuosity. In her very earliest paintings, one observes her trademark floating daubs – thickly impastoed sweeps of colour on thin, even grounds. 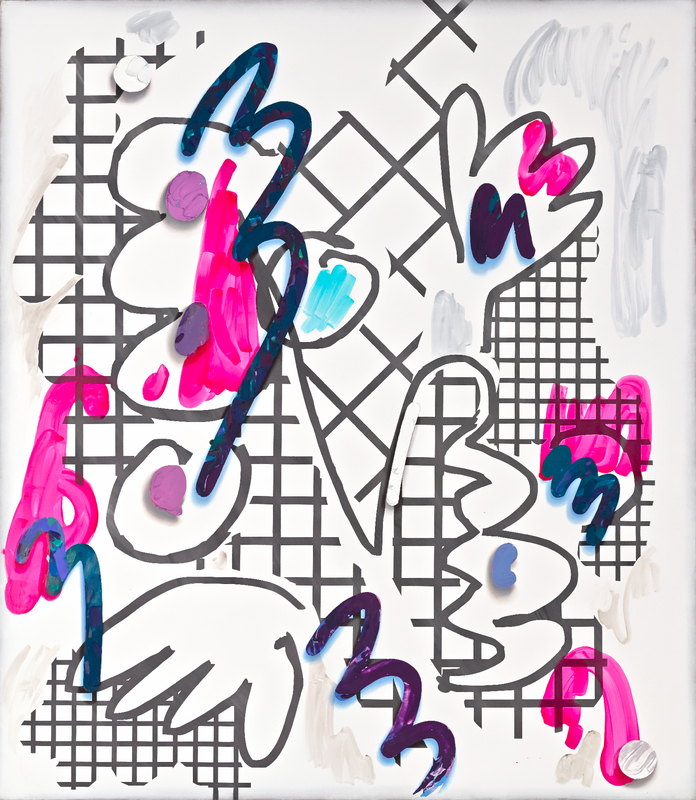 In the works in this exhibition (all untitled, all 2013), they are thicker than ever, in places curling away from the canvas like soft-scoop ice-cream. Here they are also accompanied by a whisper-soft drop-shadow, convincingly creating the impression that they are hovering about five centimetres from the canvas. But this is not new either; in an untitled work from 1997, Owens rendered crude birds in thick black paint with airbrushed trompe l’oeil shadows below. Another principal motif that repeats across these canvases is a lattice, which Owens often skews at 45 degrees to evoke a garden trellis supporting the heavy blooms of her paint. While she has made reference to Photoshop techniques in the past – in particular the unmodulated worms rendered by the ‘brush’ tool – here each composition gives the impression of being carefully planned on a computer. Nearly every painting combines numerous media: flat washes of acrylic, screen-printed grids, charcoal and oil-stick, silver flake, resin laden with pigment and trowelled-on oils. These dozen paintings offer much greater variety than a previous series of mainly abstract works, ‘Pavement Karaoke’ (2012), from which they appear to have evolved. One canvas, for instance, is gessoed to an immaculately smooth finish, then filled with an all-over jumble of cats, deftly drawn in charcoal. The most obvious instance of historical appropriation is a fluorescent but otherwise relatively faithful adaptation of Henri Matisse’s Periwinkles (Moroccan Garden) (1912).